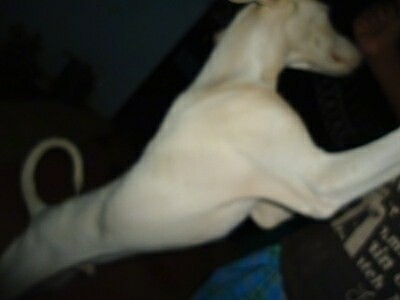 The Rajapalayam is both muscular and long limbed giving this dog a sense of balance. 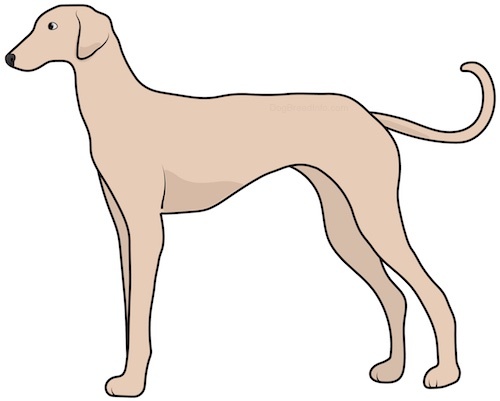 They are slender and have an elegant head with an elongated muzzle and a sharp forehead. Their jaw is known to close on a perfect scissor bite that is perfect for a war dog. They have loose skin under their short, smooth coats but no wrinkles or dewlap. Soft ears hang on the sides of their head and their eyes are dark brown. Their tail is longer and appears to be boney because of how thin the end of the slightly curled tail is. This dog comes in a variety of colors including solid brown, solid black, and spotted although the most popular and well known are the white dogs. 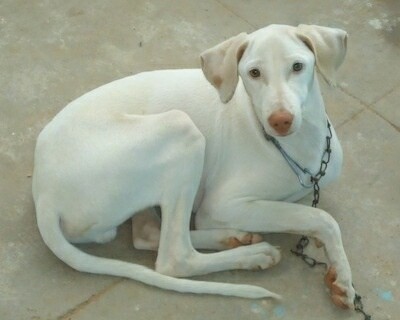 It is said that some breeders of this dog often discard puppies of different colors because they want all Rajapalayams to be pure white. Will do okay in an apartment if sufficiently exercised, but does best with at least an average-sized yard. The Rajapalayam need little grooming and are average shedders. Originally bred to hunt boar and used as guard dogs and in wars in India. The Rajapalayam were dogs of royalty. 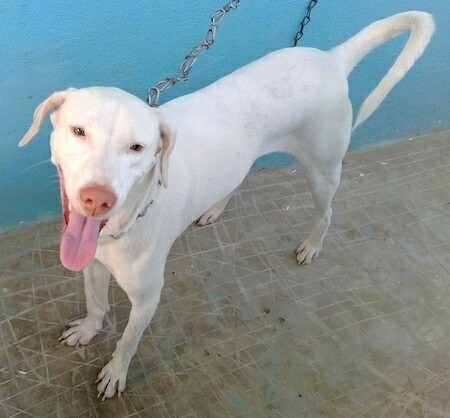 The Rajapalayam dogs got their name because they were derived from Southern India, specifically in Rajapalayam. 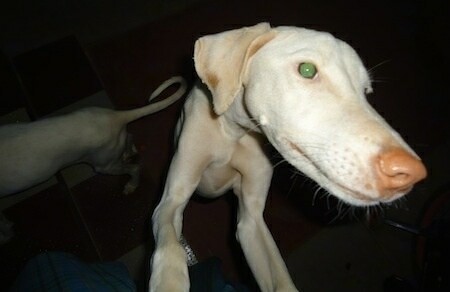 The Rajapalayam is also called the Poligar Hound and was given this name because of the Poligar clans. Poligar clans were said to have owned this breed back in ancient Southern India. They received a reputation of being fierce, aggressive, and harmful due to how they were trained. Poligar clans were known for robbing people while on the road and often used their dogs as attack dogs. There is not much known about the history of the Rajapalayam. Some say the Rajapalayam originated in the Nayak dynasty of Tamil Nadu while others say that the Rajapalayam was brought to this region by the Nayakars in the time of the Vijayanagara king’s reign. In the last theory, no one knows exactly where they originated from before the Nayakars. These dogs were traditionally used as guard dogs, hunting dogs, and war dogs although some had them simply as a companion dog. As guard dogs, they were known to protect rice fields, houses, and farms in India. They also were known to guard the border of Kashmir along with the Indian army. The Rajapalayam was able to hunt large game and was most known to hunt wild boar. In one story, it is said that they were able to kill a tiger in order to protect their owner. A well known legend suggests that when these puppies were born, they were thrown in a dark pit in order for them to grow up on their own and were only taken out once fully grown, making them temperamental towards humans. According to this ancient method, only the strongest would have survived. Because of their already aggressive reputation, they were picked up by the army and used in war. As war dogs, they were known to fight in the Polygar and Carnatic wars against the British from around 1799–1805. They were fast, aggressive, and dedicated to their task which made them a great fit for the war. This breed still lives today in rural or small villages in Tamil Nadu, India although they are slightly different from the original Rajapalayams. 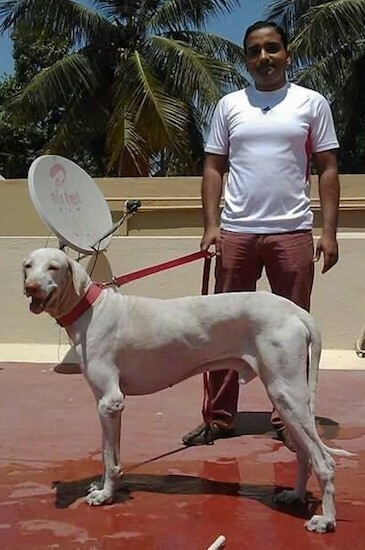 Some say the Rajapalayam was used to breed the modern day Dalmation although it has not been proven. There are current efforts to revive this breed and save it from complete extinction. 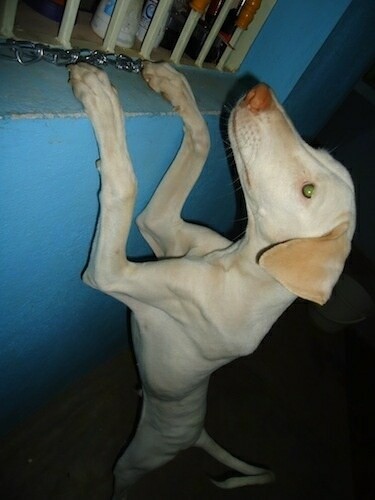 Tom the Rajapalayam at 10 months old from India—"Tom is very good and is an attractive dog, but when a stranger comes to the house he won't allow anybody to enter the home. He is a great hound and an adorable pet."